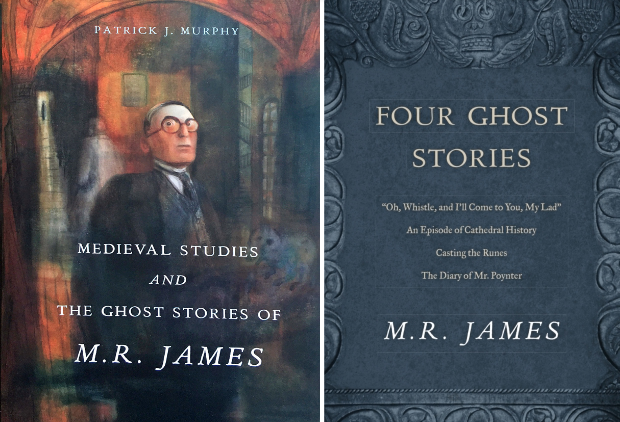 Patrick J. Murphy, Medieval Studies and the Ghost Stories of M. R. James (Penn State University Press, 2017); and M. R. James, Four Ghost Stories (Penn State University Press, 2017). Montague Rhodes James (1862-1936) was a scholar of medieval manuscripts, who served as director of the Fitzwilliam Museum in Cambridge (1893-1908), as provost of King’s College at the University of Cambridge (1905-1918), and thereafter as provost of Eton College (1918-1936), where he had been a student as a young man. Medieval historians know James primarily as the compiler of many catalogues of Cambridge manuscripts and as the translator of New Testament apocrypha, but he was also the author of several collections of ghost stories, beginning with Ghost Stories of an Antiquary (1904), More Ghost Stories of an Antiquary (1911), A Thin Ghost and Others (1919), and A Warning to the Curious and Other Ghost Stories (1925). These tales began as fireside entertainments, read aloud to a group of friends and colleagues at Christmastime, but they earned him international fame and admiration. In his influential essay “Supernatural Horror in Literature” (1927), H. P. Lovecraft lauded James as “a literary weird fictionalist of the very first rank.” It is no secret that James’ interest in ghost stories was a direct extension of his scholarly pursuits. His depiction of ghosts, at once corporeal and insubstantial, drew heavily on the rendering of the returning dead in late medieval ghost stories from Byland Abbey, which James transcribed from a fifteenth-century manuscript and published as “Twelve Medieval Ghost-Stories,” in The English Historical Review (1922). In this book, Patrick Murphy offers the first full-length study of James’ ghost stories as “tales that drew explicitly and intricately on the very subject matter of his academic expertise” (p. 18). But the book has less to do with authentic medieval resonances in James’ fiction than it does with manifestations of James’ own professional anxiety as he expressed them in his works of weird fiction. Murphy situates James in the context of a revolution in scholarly specialization when polymath Victorian antiquarians lost ground to trained classicists, archaeologists, and historians. James’ ghost stories often featured characters whose amateur investigations get them into trouble with uncanny forces. “Anxieties of amateurism” (p. 185) haunt these protagonists almost as thoroughly as the ghosts their very lack of expertise leads them to encounter. There are warnings implicit in James’ ghost stories, Murphy argues, about the dangers of uninitiated inquiry into fields of specialized knowledge. As a companion to Murphy’s monograph, the Penn State University Press has issued a small pamphlet reprinting four of James’ better-known ghost stories: “Oh Whistle, and I’ll Come to You, My Lad,” “An Episode in Cathedral History,” “Casting the Runes,” and “The Diary of Mr. Poynter.” This otherwise handsome little book suffers from some sloppy editing. The most egregious example involves its images. It reproduces with admirable clarity four black and white illustrations of James’ original tales by James McBryde, but the image accompanying “The Diary of Mr. Poynter” actually belongs to the story “Canon Alberic’s Scrap-Book,” which is not included in this collection. While a convenient purchase as a companion to Murphy’s book, this slender volume does not offer the same value as the two heftier paperback collections of James’ complete spectral tales published by Penguin Classics under the titles Count Magus and Other Ghost Stories and The Haunted Doll’s House and Other Ghost Stories. Scott G. Bruce teaches medieval history at Fordham University in the Bronx, New York. He is the editor of The Penguin Book of the Undead: Fifteen Hundred Years of Supernatural Encounters (Penguin Classics, 2016).